The following spokes on a wheel graphic demonstrates how CCIT’s mission is accomplished by interagency collaboration and the active involvement of all stakeholders in the monthly meetings process. 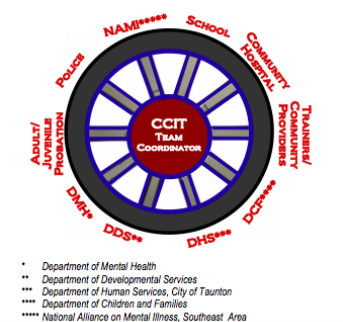 The CCIT Team Coordinator acts as the “hub” of the wheel and is the coordinator of all trainings and case conferences. CCIT Case Conferences have proven to be an effective method of conducting pre-crisis and diversion planning, probation coordination, and re-entry planning. Core Team of community members meet monthly for inter-agency collaborative and cooperative efforts and provides clinical law enforcement, and criminal justice staffing to the case conferences.